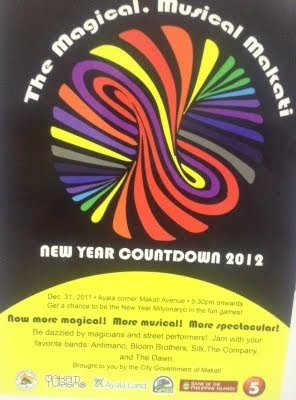 For those who'll be "stuck" in Metro Manila on New Years eve, herewith is information found by Tutubi in an underpass in Makati with the countdown party schedule, location, with live entertainment for the New Year 2012 countdown in Makati. Brought to you by City Government of Makati plus Makati Turismo, Ayala Land, MACEA, BPI TV5. there are similar New Year Countdown 2012 Manila probably in Luneta (Rizal Park), Libis (Quezon City), Cebu, Davao, Boracay, Baguio and at various restaurants. Business travel guidelines suggest maintaining all enterprise accounts in one place when visiting, you might want to use special pockets or embrace for them. I like this site! Merry Xmas and Happy New Year to you !